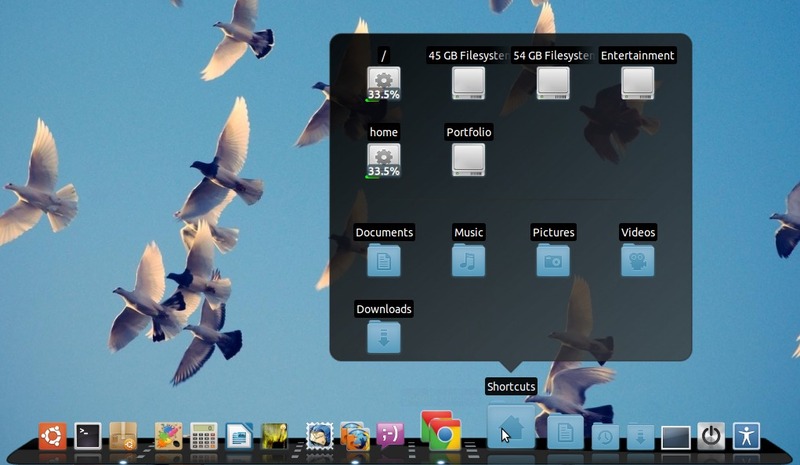 Dock is Cool, specially if you don’t like the default panel in your desktop (or if you just want an eye candy desktop). In Ubuntu 12.04 (Precise Pangolin), a lot of users complained about the Unity Desktop (which is the default one) – the loss of productivity due to sudden changes, ease of use etc. In that case, you may try some other desktop or try using Dock as a substitute for panel. 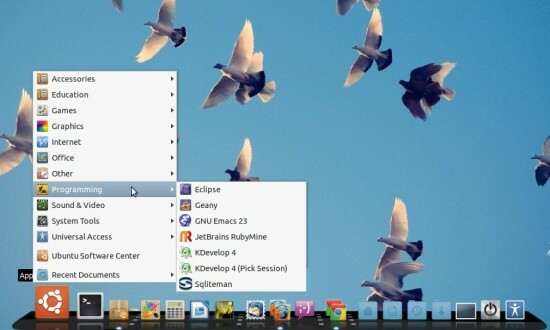 It looks beautiful – and of course it would be more easy to start/find apps and manage windows using this dock app. GLX-Dock is nothing but the Cairo Dock, mixed with some other plugins and components so that it can use your computer’s graphics capabilities in better way (hardware acceleration). Cairo Dock is a light-weight, simple and easy to use dock application. It has lot of cool features – taskbars, launchers, shortcuts, GNOME 2 style application menu, plugins (to extend the default features), workspace switcher, themes etc. You can easily customize cairo dock – the look, animation, effects, features, shortcuts, applet/plugins and default apps for Music, Mail, Chat etc. 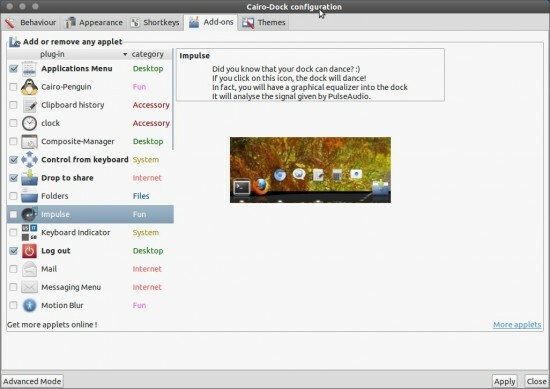 For advanced customization, go to Help -> Cairo Dock -> Configure. Then a Cairo Dock Configuration Window will appear (above snapshot) – where you can customize everything such as Appearance, Add-ons and Keyboard Shortcuts. Don’t forget to checkout the Add-On section – it contains a lot of useful and funny applets. Some of the most useful plug-ins are – Clipboard History, Drop to Share, Messaging Menu, RSS Reader, Switcher, Slider, Stack, Power Manager etc. Just select the plug-ins you want to try and click Apply to get the immediate effect. 2. Docky – A Dock that just works! Docky is another elegant, cool and powerful Dock application. It’s very fast and easy to use. By default, it looks very simple – in 2D mode but you can enable 3D mode from settings to make it more cooler. Docky doesn’t uses OpenGL but it works out of box, in GNOME Desktop environment (without any unnecessary configurations). So if you want a Dock that just works – then Docky is best for you.